Given that laptops are often easily stolen, and just a BIOS lock isn't enough anymore, I've been aiming to migrate my Laptop and other portable equipment I use to an aggressively encrypted setup. While my company issued laptop is extensively encrypted and secured, I've been relatively lax with my personal equipment. I know of a number of cases of fraud, identity theft and attempts at them and with this kind of crime growing it's well worth keeping personal information safe from those with malicious intent. While there may be install options with many distros to get this done, when migrating an existing system there is very little information on how to do it. To complicate matters, with the event driven boot of Ubuntu it doesn't have the simplicity of a serialized boot like Debian where migration to LUKS+LVM was little more than configuring a new volume in /etc/crypttab, adding it to the Volume Group and then running a pvmove, plus tidying up afterwards. There seems to be very little documentation on how to get this working without a full reinstall, so here goes my attempt at it fixing that.... it's actually rather straight forward when you know how. This process is not without risk and you need to make sure you fully understand the process and have backups that you have proven you can fully restore the system. Don't attempt this unless you fully understand what is required. 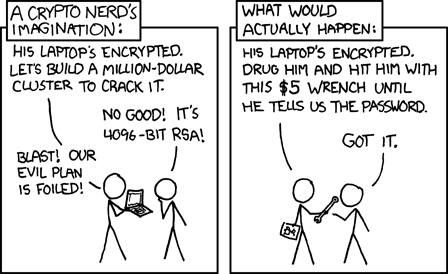 Also take the time to understand that encryption is not without it's drawbacks and can introduce additional risks. Fortunately I configure everything with LVM from the start, but for those who don't there's some extra work to get everything onto LVM first. If you haven't already you will need to make /boot/ it's own small mountpoint (I make it 512M which copes with lots of kernel updates before I have to go tidy up old kernels), and of course migrate all the data on your various mountpoints onto logical volumes. That's not what this article is about and I'm not going to explain the possible processes. If you don't have the skill make a plan and migrate the data safely to LVM then don't even think about the rest of this article is going to be appropriate either. Potentially the migration can be done after configuring LVM over LUKS but if you choose that approach then you need to work out on your own how to do it appropriately for your setup. If you need to encrypt the source volume then you will have to do a ping-pong with the data, to temporary storage, then back to the encrypted storage. It's assumed that all logical volumes are on the temporary storage and that the partition / volume we want to encrypt is free and unused for this. For this example we assume the partition you are using is /dev/sda2 - if not then substitute as necessary. ... assuming your volume group is called vg00 - if not subsitute as neccessary. Now, even though the data hasn't been moved onto the encrypted volume, having an encrypted volume as part of the volume group where the root volume resides is sufficient to get the system to prompt for the password at boot and test the setup before we move any data. The /boot/ volume/partition can't be encrypted as BIOS has to be able to read it in order to boot. Everything needed to decrypt the rest of the system at boot (except the key) will need to be stored in the initramfs in /boot/ but there's some configuration to make it all work first. Reboot and you should find a password prompt appears at the bottom of the screen. Enter the password and the system should continue to boot. Once logged in you should find the volume we created earlier is there. If any of this doesn't work then take whatever action necessary to fix it up. Removed "/dev/sdb1" from volume group "vg00"
Now the system should be running completely on the LUKS encrypted volume with LVM. It should be possible to reboot the system and come up on the new encrypted volumes. At this point it should be possible to remove the temporary storage (clear it down as needed for the security you require) and enjoy your encrypted system. Login on a text terminal (not GUI) as the user in question - this mounts the ecryptfs filesystem, but with a plain shell minimizes the files being accessed. This is a very basic setup and there are a number of variants that people have described that are worth knowing about, but not covered in detail here. Another common approach is to use an external device (say USB flash) containing the key to unlock the device. This avoids the need to type passwords, and again can be physically removed. One approach I read about describes using both an external device (say USB flash) to store a gpg encrypted key which means that not the external device and a password are required to unlock it. While this isn't really needed for most laptops unless you have a complex partitioning scheme, I've recently taken to encrypting my SSDs after I had one fail - almost all the data is probably intact in the Flash, but the controller is in a real twist and won't let me access it or erase it before disposal. By encrypting the data I just chuck them when the die without worrying about some fraudster fishing it out of the tip. In this case it will prompt twice for passwords: once for "passgroup1" and once for "passgroup2"
This will unlock subsequent devices from the hash derived from crypt_sda1. This allows keys to be stored on removable storage (eg. USB Flash) which is used as a physical "key" to unlock volumes at boot. The first thing to work out is a reliable way of identifying the device. It's bset to use one of the paths under /dev/disk/by-* so it's always in the same location. Also, choose a simple reliable filesystem. Personally ext2 or ext3 would be my preferences, but beware of FAT filesystems as there may be additional modules needed (eg. codepages) which are not present at boot. I prefer to go on filesystem label, that way I can have multiple "backup" devices with the same label and all will work. This will wait for a device matching the label "lukskeys", mount it read-only and key the devices from the file on there "machine1/alldisks.key"
The aim of all this is to make life harder for the many people who want access to your data for malicious intent while ensuring legitimate people have access. There is invariable compromises to be made. With an unencrypted filesystem, if there is some damage/corruption often at least partial recovery of data is still possible. With encryption the risk is far higher and if the data needed to decrypt the filesystem is corrupted then the entire filesystem may be inaccessible. With encryption, minor corruption can have a major effect. The above calls for good backup strategies, however, beware of image based backups of the encrypted volume since the same failures may apply. Consider carefully the scenarios you may need to recover from and what you will need to have in place to do that. Also, always run drills of recovery and ensure that you can actually recover. It's surprising how often seemingly trivial things may result in difficulty or even completely prevent restoring the system. While it doesn't affect latency significantly (that's normally dominated by disk seek time and rotational latency), there is a CPU overhead with encryption. If you shift large amounts of data, there could be significant performance degradation depending on your particular system and where the bottlenecks are. This setup is not completely secure, nor is any other, though for my purposes it achieves the goal of rendering any data on my laptop unreadable should it be stolen. The strength of the encryption deepens a whole lot on the quality of the passphrase. If a weak passphrase is used then the volume could be unlocked with a brute-force attack. When it comes to protecting data, it's trivial to install some form of keylogging device between the keyboard and system. This isn't an opportunistic attack, but when someone is determined enough and plans, there are means to achieve this. This encryption approach depends on the integrity of initramfs, which is not encrypted and hence could be tampered with. This is the same for many other software based encryption tools which depend on the integrity of boot-time software. Where hardware approaches (eg. the infamous "TPM") are deployed to ensure the integrity, hardware attacks are also possible. These have been going on for a long time on an amateur level with games consoles, so anyone determined enough is still going to have options. Protecting data is an arms race - all the time better ways of protecting data and defeating those mechanisms are being developed.